You arrive on scene, responding to an emergency call, and there is a patient, bystander, or family member that physically assaults you or your partner. It happens much more often than you may realize. Kip Teitsort, founder of DT4EMS, is well aware of the problem. “It is my opinion that the numbers of assaults have NOT increased. They are just finally making the news.” An article by Skip Kirkwood in EMS World, May 2013, introduced an initiative to end violence against EMS by the National EMS Management Association. He quotes a survey from 2005 where 52% of EMS respondents reported being assaulted. The problem is international. In October 2012 legislation was introduced in Ireland that proposed mandatory sentences for persons who assaulted emergency workers. Some of the problem is with the perception of assault on responders in the field. 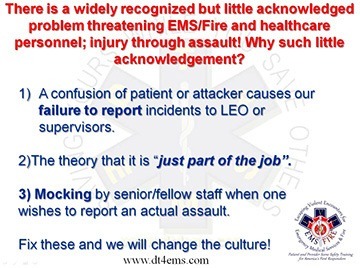 Many EMS responders do not report such instances, or are reluctant to call certain physical confrontations with patients assault in the first place. DT4EMS was started in 1996 and teaches “tactics” to EMS/ FF first responders to recognize and prevent assaults. The program focuses on a four-pronged approach to preventing and responding to assaults on personnel: The Mind, The Street, The Media, and The Courtroom. The DT4EMS Escaping Violent Encounters (EVE) is not “police-style” takedown or fighting with an attacker. The program addresses topics of recognizing the danger, scene safety, diffusing the situation, reasonable self-defense, and escape. The program is designed for all EMS, Fire, and other emergency personnel. The 16-hour training course is just as applicable in a moving ambulance as it is onscene in a ditch at an MVA incident. “We give people ‘what to practice’ in the 16-hour program. Proficiency in any skill takes practice. We state however, if people employ our ‘tactics’ they may never have to use our ‘techniques.’” For a detailed description of the course, visit their website. The program also covers the documentation necessary to ensure that those who choose to assault responders can face civil or criminal liability. This course is POST certified for CEUs for Law Enforcement Officers in Missouri. Kip has been busy expanding the reach of this program by traveling in many areas of the country to “train the trainer.” This intensive 40-hour course certifies instructors to teach the program at their own agency. The course is approved for CEUs in 16 states, and Kip has information on hosting a course at your agency for little or no cost to your department. Not all assaults on responders occur during patient interaction onscene or en route. Emergency Room Nurses and other hospital personnel also report a high rate of assault, and the organizations representing these practitioners are taking notice and getting legislative changes to protect these medical professionals. In June 2013 the State of Texas made assaults on an Emergency Room Nurse a third degree felony, on par with the charges for assaults against Paramedics, Law Enforcement Officers, and other onscene personnel. Kip addresses that in a specialized program for them as well. “We have many hospitals currently training in our EVE4HCP (Healthcare Provider). It is specific to Emergency Room staff.” For information on this course, click here. At the present time, DT4EMS,LLC has certified instructors in Alabama, Arizona, Arkansas, Colorado, Connecticut, Florida, Georgia, Kansas, Kentucky, Maine, Massachusetts, Missouri, North Carolina, Ohio, Pennsylvania, West Virginia, and Wisconsin who have trained hundreds of EMS/Fire and Healthcare professionals in the scene safety system originally created by Kip Teitsort. For information on upcoming courses, visit their website by clicking this link. You may contact Kip Teitsort at (417) 942-4962 or email kip@dt4ems.com if you have any questions. Kip Teitsort has been a First Responder since 1992, and is both a Police Officer and Paramedic. He founded DT4EMS 17 years ago, and is named a subject matter expert in the field of self-defense for EMS/Fire and Healthcare providers by the NAEMT. Kip currently travels and teaches the DT4EMS™ course to EMS providers. He has taught as a certified instructor for the Missouri Sheriff’s Training Academy as well as being the Lead Instructor of the American Hybrid Combat Karate School.